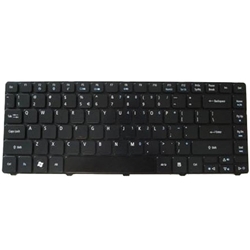 Description: New genuine Acer laptop replacement keyboard. This original notebook keyboard has a matte finish. Part #'s: KB.I140A.058, PK1307R1A01, 9J.N1P82.A1D, NSK-AMA1D. Acer Aspire 4235, 4240, 4535, 4535G, 4540, 4540G, 4736, 4736G, 4736Z, 4736ZG, 4740G.